"Meh!" token, awarded by Sjoerddebruin. "Doubloon" token, awarded by Tgr. And while someone is in there doing that..
https://github.com/danielmiessler/SecLists/blob/a823fad248aab2912a285dcfea2aae4cdde9ca7f/Passwords/10_million_password_list_top_100000.txt is possibly a good candidate to use? $wgSitename in all the various languages. Should we allow an array of password lists? I guess we could. I'm not sure if it makes that much of a difference though. Its easy enough to just include stuff from multiple sources when creating the cdb file. Hmm, the cdb thing is perhaps not the best data structure, really we should use bloom filters instead. For a "mere" 700 mb, we could have a bloom filter with a 0.01% (1 in 10,000) false positive rate containing all 306 million passwords. More realistically, 100,000 passwords is 234 kb at 0.01% false positive, 292 kb for 0.001%, 351 kb for 0.001% (1 in a million). I guess its not really clear what is an acceptable false positive rate in this context, but 1 in a million certainly seems acceptable beyond any doubt... Possibly other structures like Cuckoo filters could give even better trade-offs but i don't know much about them. Can we just store the passwords e.g. in the database? TBolliger added a project: Anti-Harassment. Does the patch above just increase the amount of passwords in the library, or does it also enforce 100,000 on account creation? We (Security or AHT, I don't care who) needs to update the minimum for Users from 100 to 100,000 in the config. AHT starts our next sprint in 2 days, if I don't hear back we'll take this on. I'm fairly confident the plan is for all new passwords to be outside 100,000. This is based on this permissioned Google Doc authored by @JBennett. It was last edited Nov. 1 so other decisions/discussions may supercede this. Is there community input required to +2 @Reedy's patch for MW core? If so, we should start that now. I guess that would happen on Meta? Even if the patch above is delayed, we should make the change in wmf-config as soon as possible. The goal of the passwd changes were really targeting WMF but I agree MW would benefit. If we can do both w/out delaying WMF changes then that sounds great. Aren't major changes to MW the responsibility of TechCom? I wouldn't think this is major enough to go through TechCom as it can be overridden on a local install level, correct? There are RfC's, and TechCom-RFC s for architecture which is TechCom. For broader community consultation (more than a User-notice heads-up announcement in Tech News about some changes to take place) see non-public office:Community Relations for specialist support. And mentioning for completeness only: For config changes per wiki (which require per-community consensus) see mw:Requesting_wiki_configuration_changes. Thanks @Aklapper. I'm still learning about the layers of communication that exist around here. John and @CKoerner_WMF are working on public facing communication, aiming for Dec. 13. Tgr merged a task: T218359: Replace PasswordCannotBePopular with PasswordNotInLargeBlacklist on Wikimedia wikis. Do we have a timeline for this? PasswordCannotBePopular has been deprecated in core and our using of it is spamming the logs. If we don't plan to do this soon, we should probably revert or temporarily disable the deprecation. I think we're good to merge in the coming weeks. I would suggest you wait until T211621 and T211622 are merged and deployed, just to be safe. The two tasks that @TBolliger points too are a bug fix for and an improvement on the original work we did to enforce longer passwords. None of that work, at least to my eye, really touches this popular password blacklist. I think the work for popular passwords and password length, while near each other in the code, likely don't touch much of the same code. Could we make a patch that removes our usage of the deprecated method in favor of the new one that is separate from both of these concerns? 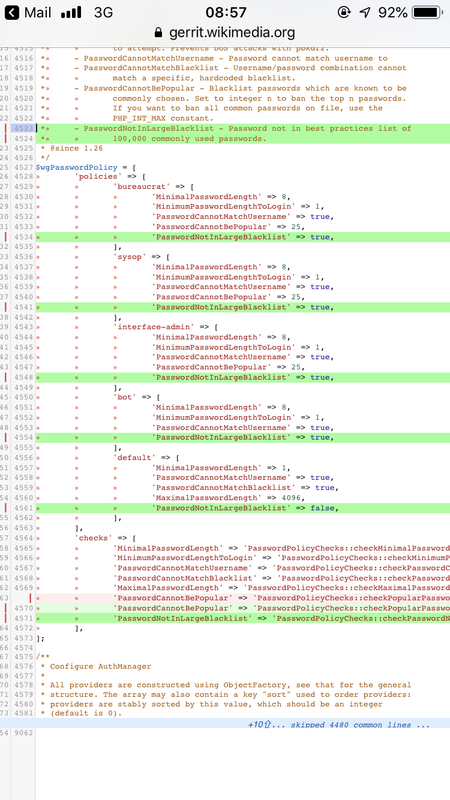 I think the work for popular passwords and password length, while near each other in the code, likely don't touch much of the same code. Increase password length to 8. This is a trivial config change. Replace the old, smaller password blacklist with the new, larger one. This is a trivial config change (plus a lot of work to provide the new list, which is what most of this task was about, but that has concluded several months ago). Exempt non-privileged users from getting login warnings due to the new changes. This is what most of the recent work was about. 1 depends on 3, since we want to minimize impact on existing users. 2 probably also does for the same reason, although I don't think there was any discussion on that. 1 and 2 are unrelated, except doing them at the same time might be nicer in terms of messaging / user confusion (but not a big deal either way). Could we make a patch that removes our usage of the deprecated method in favor of the new one that is separate from both of these concerns? The current patch already is separate as far as I can see, although we might want to change it to have suggestChangeOnLogin => true for the default policy group (and false for the others), per above. although we might want to change it to have suggestChangeOnLogin => true for the default policy group (and false for the others), per above. T211550: Password length check should count unicode characters is another (minor) thing that we should fix at some point and it will make some valid passwords invalid, so we might as well do it in the same batch.